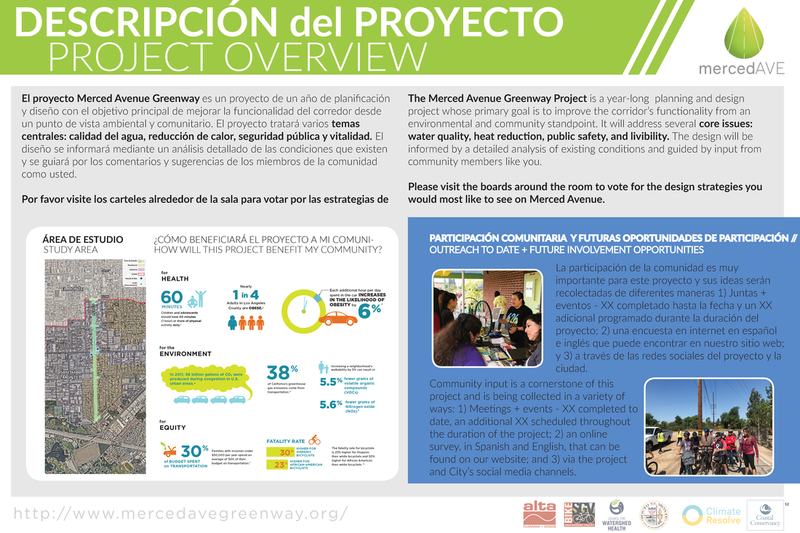 The Merced Avenue Greenway Project focuses on the planning and design of a shovel-ready, retrofit for the Merced Avenue corridor. The Planning Phase will identify the existing conditions, considerations, and constraints and opportunities that will inform the Design Phase. The team will examine the feasibility and optimization of various scenarios for managing stormwater, and addressing other community-identified needs. The Planning Phase is intended to evaluate opportunities to incorporate surface and sub-surface Low Impact Development Best Management Practices (LID BMPs). The sprawling concrete landscape of our region poses various water challenges, including making it difficult to maintain local water resources that supplies our community. As climate change increases the likelihood of longer droughts, the demand for clean accessible water also increases. By helping to sustain local water supplies, we can create healthier communities that are greener, minimize water pollution and health risks, save money and energy, and protect our drinking water resources. When it rains here in South El Monte, there is an opportunity to capture the stormwater runoff, clean it for our local use, and keep it from polluting our streams and ocean. One stormwater management strategy is commonly referred to as low impact development best management practices (LID BMPs). LID BMPs mimic the slow/spread/sink functions of the natural environment where they 1) slow the water down, 2) spread it out to filter pollutants, and 3) allow it to sink into the soil. These strategies result in multiple benefits such as reduced flooding, cleaner streets, and increased water supply and habitat for wildlife. With your help and input, we hope to incorporate these types of BMPs into the Merced Avenue Greenway! Due to high amounts of paved surface area - streets, sidewalks, etc. -, urban areas can be up to 4-5°F than surrounding areas. Urban air temperatures mean decreased air quality and increased risk of heat -related illnesses. UCLA climate scientists predict that temperatures in the Los Angeles region will rise 3.5-5°F over the next 20-40 years. The number of extreme heat days (days above 95°F) are expected to double, and even triple, in some parts of the city. Using cool construction materials, like cool roofs and cool paving that reflect instead of absorb heat, can lower surface air temperatures. Increasing urban tree canopy and pervious landmass will provide shade and a natural air conditioning system for heat-afflicted cities. The development of safer streets increases bicycling as a mode of transportation, and thereby promotes public health, supports local commercial districts, encourages community connections, and improves quality of life for all members of the public. Riding a bicycle is an inviting and safe means of transportation for people of all ages and riding abilities! Great way to avoid polluting the neighborhood while burning calories and discovering all that South El Monte has to offer. In 2015, the Office of Traffic Safety reported 145 persons were seriously injured or killed due to motor vehicle collision in South El Monte. 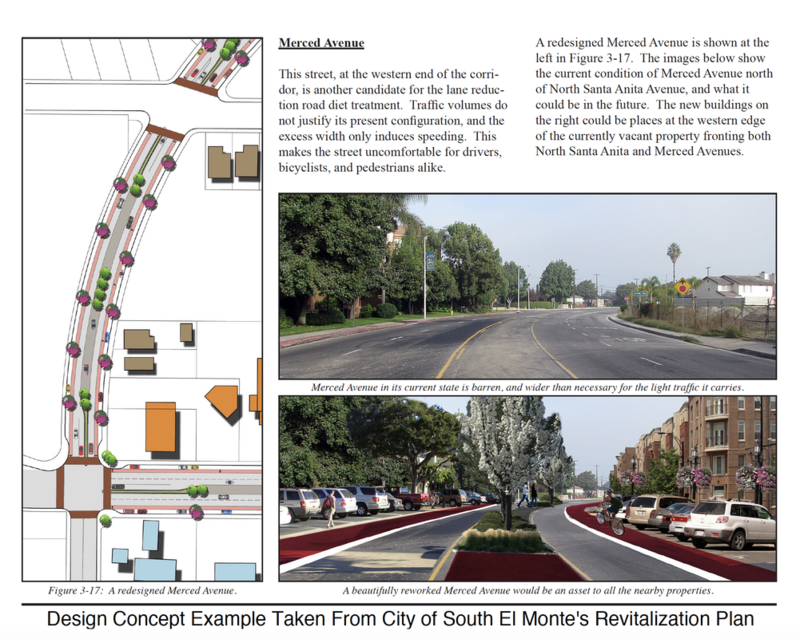 Many South El Monte residents, children and older adults walk on Merced Ave to connect to Shively/New Temple, Whittier Narrows, or the South El Monte Community/Senior Center. It's important to address speeding concerns through street design to develop a street to accommodate all users of the road.